Manuel Eduardo Martínez-Cruz1, Yuri B. Okolodkov2*, Ana Concepción Aguilar-Trujillo3 & Jorge Alfredo Herrera-Silveira3. To determine the epiphytic dinoflagellate taxocoenosis, to study the vertical distribution of dinoflagellates along the leaves of the seagrass Thalassia testudinum and to evaluate the potential risk of ciguatera, based on the year-round sampling at Dzilam, the northern Yucatan Peninsula, were the main objectives. Seagrass samples were taken monthly from 15 May 2012 to 20 May 2013, 100 m from the coastline. Water temperature varied between 22.3 oC (February) and 36.5 oC (April), and salinity varied between 29.6 (April) and 37.3 (May 2012). In total, 18 epiphytic dinoflagellate species were found. The genus Prorocentrum was predominant in terms of the number of species (7). Prorocentrum lima (up to 2228 cells/g of Thalassia wet weight, in April), P. cf. sipadanensis (up to 1111 cells/g, in August) and Peridinium quinquecorne (up to 987 cells/g, in January) largely determined the annual dynamics of the entire taxocoenosis. The dinoflagellate cell abundance usually increased towards the apices of the leaves throughout the year, and the highest cell abundances were observed in the apical (the oldest) 12-20-cm part of the seagrass. The annual dynamics of the total dinoflagellate cell abundance was characterized by two peaks, in August 2012 and April 2013. The lowest cell abundance was observed in February and May 2013. Considering the data presently available on the toxicity and our results on the dominant species, P. lima may represent a major threat at Dzilam. Other potentially toxic species were: Amphidinium carterae, Coolia sp., Prorocentrum concavum, P. foraminosum, P. hoffmannianum and P. rhathymum. Los objetivos principales del presente estudio fueron determinar la taxocenosis de los dinoflagelados epifíticos, estudiar la distribución vertical de dinoflagelados de las hojas del pasto marino Thalassia testudinum así como evaluar el posible riesgo de la ciguatera con base en el muestreo anual en Dzilam, en el norte de la Península de Yucatán. Muestras del pasto marino se tomaron mensualmente del 15 de mayo de 2012 al 20 de mayo de 2013, a la distancia de 100 m de la línea de la costa. La temperatura de agua varió entre 22.3 oC (febrero) y 36.5 oC (abril) y la salinidad entre 29.6 (abril) y 37.3 (mayo de 2012). En total, se registraron 18 especies de dinoflagelados epifíticos. El género Prorocentrum fue predominante en cuanto al número de especies (7). Prorocentrum lima (hasta 2228 cél./g del peso húmedo de T. testudinum, en abril), P. cf. sipadanensis (hasta 1111 cél./g, en agosto) y Peridinium quinquecorne (hasta 987 cél./g, en enero) determinaron en gran medida la dinámica anual de la taxocenosis entera. La abundancia celular de dinoflagelados usualmente se incrementó hacia los ápices de las hojas en el transcurso del año, y las abundancias celulares más altas se observaron en la parte apical (la más vieja) de 12-20 cm del pasto marino. La dinámica anual de la abundancia celular total de dinoflagelados se caracterizó por dos picos, en agosto de 2012 y abril de 2013. La abundancia celular más baja se observó en febrero y mayo de 2013. Considerando los datos disponibles sobre toxicidad hasta el presente y con nuestros resultados sobre las especies dominantes, P. lima representa la mayor amenaza en Dzilam. Otras especies potencialmente toxicas fueron: Amphidinium carterae, Coolia sp., Prorocentrum concavum, P. foraminosum, P. hoffmannianum y P. rhathymum. Seagrass beds are common in a shallow zone along the northern Yucatan Peninsula, and Thalassia testudinum Banks et Solander ex König (Angiospermatophyta: Hydrocharitaceae) is the most common species (Okolodkov, pers. obs.). As a habitat and a refuge for hundreds of species from microalgae to sea turtles and manatees, it also represents a risk for human health due to some toxic epiphytic dinoflagellates, including the species that cause ciguatera. Recently, there was a report on ciguatera-related biotoxins from the northern Yucatan coast found in humans poisoned by eating the great barracuda Sphyraena barracuda (Sphyraenidae) (Okolodkov et al. 2014). Earlier, in the period of 1984-2004, in the Yucatan Peninsula, 23 cases of ciguatera were reported; the carnivorous fishes (Lutjanus spp., Epinephelus spp, Mycteroperca spp. and the great barracuda) were involved in all cases reported for Mexico, on the whole (Nuñez-Vásquez et al. 2008). In the southern Gulf of Mexico, the epiphytic dinoflagellates have been the object of the taxonomic and ecological studies performed in Veracruz and Yucatan (Okolodkov et al. 2007, 2014, Aguilar-Trujillo et al. 2014), and both seagrasses and seaweeds were sampled. However, more detailed studies on selected seagrass species are still lacking, and the vertical distribution of the cell abundance and the species are unknown. To determine the epiphytic dinoflagellate taxocoenosis, to study the vertical distribution of dinoflagellates along the T. testudinum leaves and to evaluate the risk of ciguatera based on year-round sampling were the main objectives of this study. Samples of T. testudinum (Fig. 1) were taken monthly, at 10:30-12:30 a.m., from 15 May 2012 to 20 May 2013, 100 m from the coastline, at Dzilam de Bravo (Dzilam, for short), the northern Yucatan Peninsula in the southeastern Gulf of Mexico (21°23’36.86”N, 88°53’46.98”W). At a site with a depth of 1.0-1.3(1.7) m, 10 to 15 leaves were separated with a knife and placed into a plastic 500-ml bottle. On shore, leaves of 35-60 cm length were immediately cut into three equal (basal without rhizome, medium and apical) parts and placed in three bottles with seawater taken from the sampling site and fixed with 37% formalin to a final concentration of 4%. Water temperature and salinity were measured with a YSI-Professional Plus (Yellow Springs, Ohio, USA). In the laboratory, the epiphytes were separated by vigorous agitation for one minute, stained with a 0.2% Trypan Blue water solution and counted in a Sedgwick-Rafter chamber under an inverted Olympus CKX-41 microscope in a bright field following the procedure described earlier (Okolodkov et al. 2007). The cell counts were recalculated so that the results could be presented as cells per gram of T. testudinum wet weight (cells/g TWW). Dinoflagellate species were identified under an inverted microscope, considering our previous, more thorough morphological observations on cells obtained from the same study area (Okolodkov et al. 2009, 2014, Aguilar-Trujillo et al. 2014) using a compound Olympus BX51 microscope and a JEOL JSM5310LV scanning electron microscope. Okolodkov et al. (2009) erroneously reported Gambierdiscus caribaeus as G. toxicus. Some species were identified tentatively because data were lacking for some diagnostic features such as the periflagellar area in Prorocentrum species. During the study period, water temperature varied between 22.3 oC (February) and 36.5 oC (April) and salinity between 29.6 (April) and 37.3 (May 2012). In total, 18 dinoflagellate species were found: Amphidinium carterae Hulburt, Bysmatrum caponii (Horiguchi et Pienaar) Faust et Steidinger, Cabra cf. aremonica Chomérat, Couté et Nézan, Coolia sp., Durinskia cf. capensis Pienaar, Sakai et Horiguchi, Peridinium quinquecorne T.H. Abé, Prorocentrum concavum Fukuyo, P. foraminosum Faust, P. hoffmannianum Faust, P. lima (Ehrenberg) Dodge, P. rhathymum Loeblich III, Sherley et Schmidt, P. sculptile Faust, P. cf. sipadanensis Mohammad-Noor, Daugbjerg et Moestrup, Prorocentrum sp., Sinophysis ebriola (Herdman) Balech, S. microcephala Nie et Wang, S. stenosoma Hoppenrath and (?) Togula sp. The genus Prorocentrum was predominant in terms of the number of species (7). Other dominant species (those contributing more than 10% of the total dinoflagellate cell abundance in a sample) were as follows: Prorocentrum lima (up to 2228 cells/g TWW, in April), P. cf. sipadanensis (up to 1111 cells/g, in August), Peridinium quinquecorne (up to 987 cells/g, in January), Prorocentrum rhathymum, P. hoffmannianum, P. concavum, Coolia sp. and Bysmatrum caponii were the most abundant species (Fig. 2 and 3). The former three largely determined the annual dynamics of the entire taxocoenosis, and the highest cell abundances per sample were observed in the apical 12-20 cm part of the seagrass. The annual dynamics of the total dinoflagellate cell abundance was characterized by two peaks, in August and April (Fig. 4). The lowest cell abundances were observed in February and May 2013. Comparing the cell abundances found in May 2012 and May 2013, the difference is significant; thus interannual changes in physical-chemical conditions must be involved. 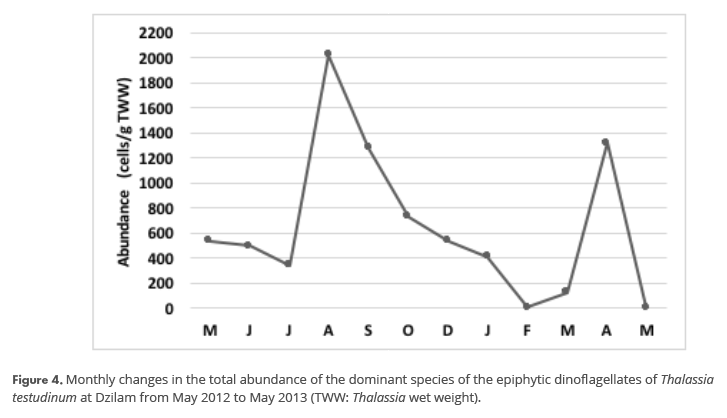 The dinoflagellate cell abundance usually increased towards the apices of the leaves throughout the year, with two pronounced peaks of 3841 and 2584 cells/g TWW, in August and April, respectively (Fig. 5). Only in July was it significantly higher (2229 cells/g TWW) in the medium part and in September in the basal part. Although Gambierdiscus caribaeus Vandersea, Litaker, Faust, Kibler, Holland et Tester (Fig. 2I) was not observed on T. testudinum leaves, rare cells of this species were found in seaweed samples taken from July through December at sampling sites located 75, 100 and 200 m from the coastline (this study). Unlike in earlier studies on the epiphytic dinoflagellates performed along the northern coast of the Yucatan Peninsula, the benthic-planktonic Peridinium quinquecorne was observed for the first time among the dominant species in the taxocoenosis of epiphytic dinoflagellates. This species has been known to be a blooming species in the state of Veracruz, southwestern Gulf of Mexico (Aké-Castillo et al. 2014, Pérez-Morales et al. 2015, Rodríguez-Gómez et al. 2015). 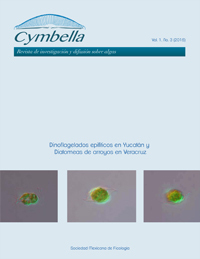 It is curious that P. quinquecorne was not observed as a part of the epiphytic dinoflagellate taxocoenosis in Veracruz whereas in the northern Yucatan it was. Similar to Veracruz, Prorocentrum lima was the principal dominant species in our study. Unlike our study, in previous studies in the northern Yucatan waters, Prorocentrum rhathymum was frequently the predominant species responsible for the annual dynamics of the entire taxocoenosis of epiphytic dinoflagellates (Aguilar-Trujillo et al. 2014, Okolodkov et al. 2014). Earlier, it was shown that P. rhathymum prefers low nutrient concentrations and that P. lima is correlated with high ammonium concentrations (Okolodkov et al. 2014), so the shift from P. rhathymum to P. lima as the dominant species can be explained by the eutrophication of the coastal waters at Dzilam after a long-term red tide that occurred in the study area in 2011 and maintained itself for several months (Merino-Virgilio et al. 2014). As for the vertical distribution of the dinoflagellate cell abundance along the seagrass leaves, it is obvious that fish species that prefer feeding on the apices (Lobel & Ogden 1981), as does the permanent dweller of the seagrass beds in the eastern Caribbean, the herbivorous bucktooth parrotfish Sparisoma radians (Scaridae), have a greater potential for accumulating dinoflagellate toxins through the food web. In the islands of the West Indies, among marine spermatophytes, only the seagrasses Thalassia testudinum and Syringodium filiforme Kütz. (syn. : Cymodocea manatorum Asch.) are eaten by reef fishes in significant quantities (Rundall 1967). Some fishes from the families Kyphosidae, Scaridae and Acanthuridae had plant material constituting more than 50% by volume of the stomach contents; in addition, some omnivorous fishes fed heavily on marine plants. Four seagrass species, including T. testudinum, were found in the stomachs of more than 30 species of mainly coral reef-dwelling fishes primarily from the families Scaridae and Acanthuridae, but also from the Sparidae, Monacanthidae, Tetradontidae and Ostraciontidae (Rundall 1967). In addition, the families Syngnathidae, Gobiidae, Labridae, Gerreidae, Scorpaenidae, Sciaenidae and Blennidae are also among typical seaweed grazers in many geographical areas around the world (Pollard 1984). In the Lobos Reef, in the northern part of the state of Veracruz, the most abundant coral reef fishes associated with T. testudinum are Scarus iseri and Sparisoma radians (Scaridae), Halichoeres bivittatus (Labridae), Stegastes adustus and Stegastes leucostictus (Pomacentridae) (González-Gándara & Trinidad-Martínez 2006). In south Florida and the Caribbean Sea, apart from fishes, sea urchins and green turtles constitute the major groups that graze seagrass meadows (Ogden et al. 1973, Zieman et al. 1984). Additionally, gastropods, crustaceans and sea mammals should be added to this list (Valentine & Heck 1999). Seagrasses were shown to be a significant food source for juvenile fish in and offshore from south Texas lagoons (Fry & Parker 1979). In general, seagrass meadows provide shelter from predators and an abundant food source (“board and lodging”), functioning as a nursery ground (Rundall 1967, Pollard 1984). Valentine & Heck (1999) estimated that about 3 to 100% of seagrass net primary production enters food webs via the grazing pathway. These results are crucial to the understanding of the scale of the ciguatera transfer through food webs. Also, it is clear that the annual dynamics of the epiphytic dinoflagellate taxocoenosis, at least in terms of the maximal cell abundances, depend primarily on the growth of the dominant species, Prorocentrum lima, P. cf. sipadanensis and Peridinium quinquecorne on the apical (the oldest) part of the seagrass leaves. Gambierdiscus caribaeus was recently shown to be a ciguateric species (Holland et al. 2013). Previously, it was found in May and November 2008 in abundance in shallow waters at two localities near Dzilam (Okolodkov et al. 2014). Therefore, the study area can be considered potentially ciguateric. The following dinoflagellate species found in the study area on T. testudinum may represent a threat to human health: Amphidinium carterae (produces haemolytic substances, ichthyotoxins, and it was also implicated as a causative agent of ciguatera; Baig et al. 2006), Coolia sp. (in tropical waters, at least two species, C. tropicalis Faust and C. malayensis Leaw, Lim et Usup, produce ichthyotoxic cooliatoxin; Momigliano et al. 2013), Prorocentrum concavum (okadaic acid and ichthyotoxins), P. foraminosum (dinophysistoxin-1), P. hoffmannianum (okadaic acid and fast-acting toxins), P. lima (okadaic acid, dinophysistoxin-1, dinophysistoxin-2, prorocentrolides and fast-acting toxins) and P. rhathymum (okadaic acid). Some dinoflagellates that had been considered non-toxic have been shown to produce toxins, specifically P. foraminosum (dinophysistoxin-1; Kameneva et al. 2015). In addition, there are some species whose toxicity is yet unknown (e.g., P. sipadanensis). Considering the data presently available on the toxicity and our results on the dominant species, P. lima and P. rhathymum may represent a major threat at Dzilam. Application of both inverted light and scanning electron microscopy allows the abundance estimation and identification to species or generic level. However, this does not guarantee an absolute resolution of the quantification vs. identification problem, due to the impossibility of applying both types of microscopy to the same cells, a common problem remaining to be solved in ecological studies. We are grateful to Cristian A. Kantún-Manzano (CINVESTAV-IPN, Merida, Mexico) for his help in sampling, to Fany del C. Merino-Virgilio (CINVESTAV-IPN, Merida, Mexico) for her help in processing seagrass samples in the laboratory, to Ismael Gárate-Lizárraga (CICIMAR-IPN, La Paz, Baja California Sur, Mexico), Marina S. Selina (A.V. Zhirmunsky Institute of Marine Biology of the Far Eastern Branch of the Russian Academy of Sciences, Vladivostok, Russia) and Horacio Pérez-España (ICIMAP-UV, Boca del Río, Veracruz, Mexico) for help with the literature and valuable advice, and to Marcia M. Gowing (University of California at Santa Cruz, California, USA) for improving the English style of the manuscript. Field trips were supported by CINVESTAV-IPN, Merida, and several projects given to JAHS. Aguilar-Trujillo, A.C., Y.B. Okolodkov, F. del C. Merino-Virgilio, I. Osorio-Moreno, J.A. Herrera-Silveira. 2014. Variación espacial de dinoflagelados bentónicos/epifíticos en aguas costeras del norte de Yucatán (agosto de 2011). In A.V. Botello, J. Rendón von Osten, J.A. Benítez & G. Gold-Bouchot. Eds. Golfo de México. Contaminación, impacto ambiental, diagnóstico y tendencias. 3a ed. UAC, UNAM-ICMYL, CINVESTAV-Unidad Mérida, Campeche. pp. 147-160. Aké-Castillo, J.A., Y.B. Okolodkov, C.F. Rodríguez-Gómez & G. Campos-Bautista. 2014. Florecimientos algales nocivos y contaminación en Veracruz: especies y posibles causas (2002-2013). In A.V. Botello, J. Rendón von Osten, J.A. Benítez & G. Gold-Bouchot. Eds. Golfo de México. Contaminación, impacto ambiental, diagnóstico y tendencias. 3a ed. UAC, UNAM-ICMYL, CINVESTAV-Unidad Mérida, Campeche. pp. 133-146. Baig, H.S., S.M. Saifullah & A. Dar. 2006. Occurrence and toxicity of Amphidinium carterae Hulburt in the North Arabian Sea. Harmful Algae 5: 133–140. Fry, B. & P.L. Parker. 1979. 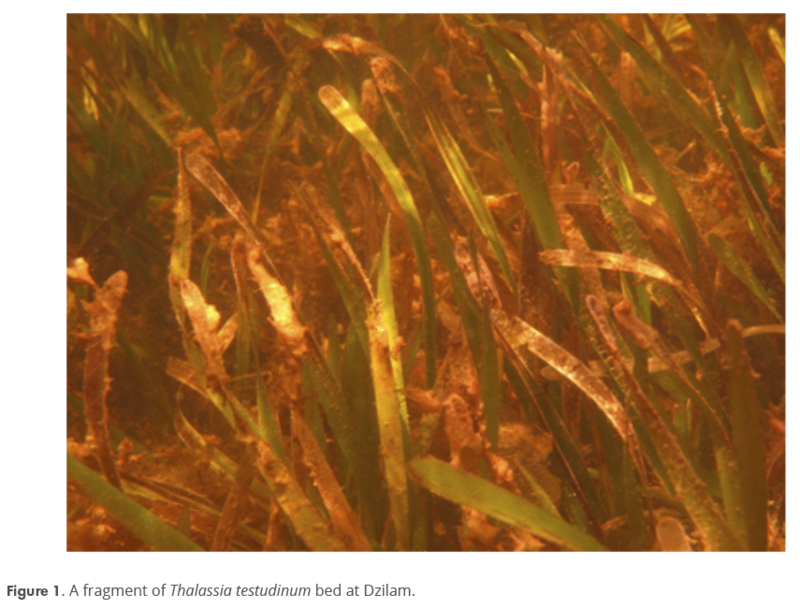 Animal diet in Texas seagrass meadows: 13C evidence for the importance of benthic plants. Estuarine and Coastal Marine Science 8: 499-509. González-Gándara, C. & S. del C. Trinidad-Martínez. 2006. Peces ligados a Thalassia testudinum en el arrecife Lobos, Veracruz, México: diversidad y abundancia. Revista de Biología Tropical 54: 189-194. Holland, W.C., R.W. Litaker, C.R. Tomas, S.R. Kibler, A.R. Place, E.D. Davenport & P.A. Tester. 2013. Differences in the toxicity of six Gambierdiscus (Dinophyceae) species measured using an in vitro human erythrocyte lysis assay. Toxicon 65: 15-33. Kameneva, P.A., K.V. Efimova, V.G. Rybin & T.Y. Orlova. 2015. 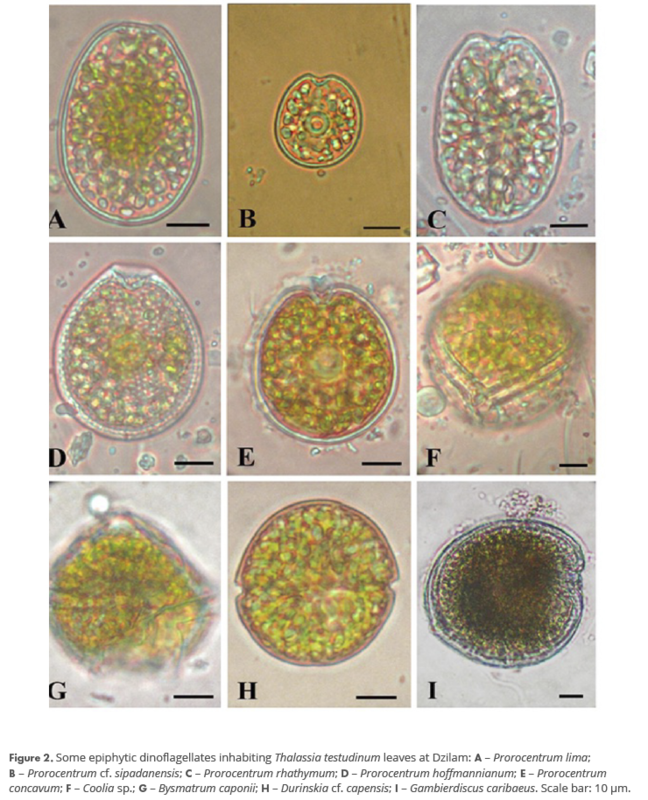 Detection of dinophysistoxin-1 in clonal culture of marine dinoflagellate Prorocentrum formainosum (Faust M.A., 1993) from the Sea of Japan. Toxins 7: 3947-3959. Lobel, P.S. & J.C. Ogden. 1981. Foraging by the herbivorous parrotfish Sparisoma radians. Marine Biology 64: 173-183. Merino-Virgilio, F. del C., Y.B. Okolodkov, A.C. Aguilar-Trujillo, I. Osorio-Moreno, J.A. Herrera-Silveira. 2014. Florecimientos algales nocivos en las aguas costeras del norte de Yucatán (2001-2013). In A.V. Botello, J. Rendón von Osten, J.A. Benítez & G. Gold-Bouchot. Eds. Golfo de México. Contaminación, impacto ambiental, diagnóstico y tendencias. 3a ed. UAC, UNAM-ICMYL, CINVESTAV-Unidad Mérida, Campeche. pp. 161-180. Momigliano, P., L. Sparrow, D. Blair & K. Heimann. 2013. The diversity of Coolia spp. (Dinophyceae Ostreopsidaceae) in the central Great Barrier Reef region. PLOS ONE 8(10), e79278: 1-11. Nuñez-Vásquez, E., J.L. Ochoa, C. Band-Schmidt, I. Gárate-Lizárraga, A. Heredia-Tapia, D. López-Cortéz, F.E. Hernández-Sandoval & J. Bustillos-Guzmán. 2008. Ciguatera in Mexico. In: Abstracts of the 13th International Conference on Harmful Algae, 3-7 November 2008, Hong Kong. p. 98. Ogden, J.C., R. Brown & N. Salesky. 1973. Grazing by the echinoid Diadema antillarum Philippi: formation of halos around West Indian patch reefs. Science 182: 715-717. Okolodkov, Y.B., G. Campos-Bautista, I. Gárate-Lizárraga, J.A.G. González-González, M. Hoppenrath & V. Arenas. 2007. Seasonal changes of benthic and epiphytic dinoflagellates in the Veracruz reef zone, Gulf of Mexico. Aquatic Microbial Ecology 47(3): 223-237. Okolodkov, Y.B., F. del C. Merino-Virgilio, J.A. Herrera-Silveira, S. Espinosa-Matías, M.L. Parsons. 2009. Gambierdiscus toxicus in the southeastern Gulf of Mexico. Harmful Algae News. The Intergovernmental Oceanographic Commission of UNESCO 40: 12-14. Okolodkov, Y.B., F. del C. Merino-Virgilio, J.A. Aké-Castillo, A.C. Aguilar-Trujillo, S. Espinosa-Matías & J.A. Herrera-Silveira. 2014. 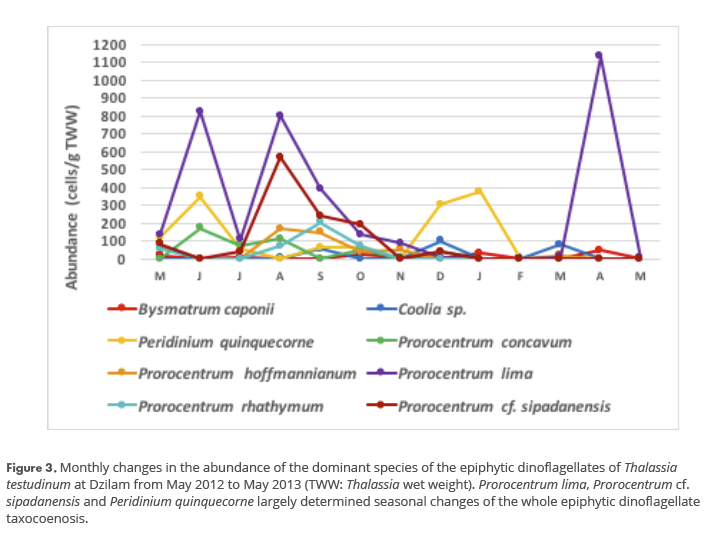 Seasonal changes in epiphytic dinoflagellate assemblages near the northern coast of Yucatan Peninsula, Gulf of Mexico. Acta Botanica Mexicana 107: 121-151. Pérez-Morales, A., J.A. Aké-Castillo, Y.B. Okolodkov & G. Campos-Bautista. 2015. Florecimientos algales nocivos y eutrofización frente a la costa del Puerto de Veracruz, suroeste del Golfo de México. E-BIOS 2(8): 21-33. Pollard, D.A. 1984. A review of ecological studies on seagrass-fish communities, with particular reference to recent studies in Australia. Aquatic Botany 18: 3-42. Rodríguez-Gómez, C.F., J.A. Aké-Castillo, G. Campos-Bautista & Y.B. Okolodkov. 2015. Revisión del estudio del fitoplancton en el Parque Nacional Sistema Arrecifal Veracruzano. E-BIOS 2(8): 178-191. Rundall, J.E. 1967. Food habits of reef fishes of the West Indies. Studies in Tropical Oceanography 5: 665-847. Valentine, J.F. & K.L. Heck, Jr. 1999. Seagrass herbivory: evidence for the continued grazing of marine grasses. Marine Ecology – Progress Series 176: 291-302. Zieman, J.C., R.L. Iverson & J.C. Ogden. 1984. Herbivory effects on Thalassia testudinum leaf growth and nitrogen content. Marine Ecology – Progress Series 15: 151-158. Corregido: 28 de febrero 2016. Aceptado: 29 de febrero 2016. Revisores: E. Novelo, I. Gárate-Lizárraga y un revisor anónimo.